← Happy 20th Birthday To the World Wide Web! Want to learn to play Piano … There’s an app for that and a nifty little lighted keyboard to go with it. 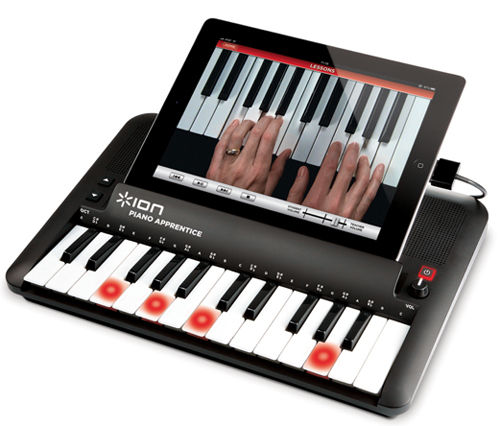 The folks at ION Audio (No relation to us) developed a cool 25 key piano keyboard dock to go with your iPad, iPhone or iPod touch. The keys on the Piano Apprentice dock are backlit to assist you in learning to play and there’s a free teaching app in the iTunes store. The screen on your iOS device can either display sheet music or a pair of hands and keyboard to help guide you while you play. This entry was posted in Mac, News, Toys and tagged ipad, ipad 2, Ipad2, iphone, iphone 4, ipod, ipod touch, learn to play piano app, piano app, piano apprentice, piano apprentice dock, piano learning app. Bookmark the permalink.